Pat was very appreciative of the Thanksgiving meal he received. Pat was raised by his mother. He is the oldest in his family among eight siblings, with four brothers and four sisters. 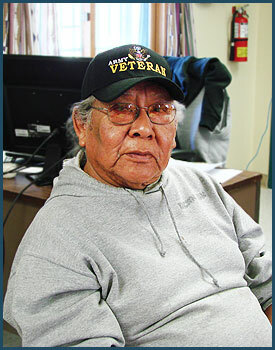 He is a lifelong resident of Tohatchi and attended boarding school in the community until he transferred to Intermountain Indian School in Brigham City, Utah. While in high school, he wasn’t able to come home for Thanksgiving because of the great distance — over 500 miles one way. Thanksgiving at the boarding school wasn’t a big deal. There was a traditional turkey dinner, but everything was artificial — instant mashed potatoes, instant gravy, canned jelly cranberries, and even the turkey was bland. After high school, Pat went to Denver to be a welder. He worked in that field for two years until he was drafted into the U.S. Army. Once his service was completed, he returned home. Recalling Thanksgiving in the Army, the meal served was a traditional turkey dinner with all the fixings, which was wonderful. Pat is an entertainer and enjoys working with Veterans’ groups and chapter houses. Once he returned home, Pat trained to be a police officer and met his future wife, June. Their “how we met” story was unique. She was speeding, so he stopped her and gave her a speeding ticket. They ended up dating and eventually got married. Pat and June had three children, but later they divorced. They now have eight grandchildren together. After going back to school, Pat eventually graduated from the University of New Mexico with a degree in Human Services. He spent the next 18 years working for the Navajo Nation Division of Social Services and the Tohatchi High School. Pat enjoys playing guitar and singing. He is an entertainer and enjoys working with Veterans’ groups and chapter houses, providing the music for various events. When remembering his favorite Thanksgiving, he shared that his whole family would get together for Thanksgiving in Buffalo Springs. The family consisted of his mother, siblings and their families, as well as Pat and his family. Once his mother passed away, this family gathering changed — nothing really seemed the same. His siblings didn’t gather much after that and he often spent Thanksgiving with his church family. Once the truck arrived, the center had six volunteers to help set up for the distribution. We enjoyed visiting with Pat, despite the busy season. November and December are busy months in our distribution center. The Phoenix office serves over 40 tribes and Pueblos in the Southwest. During the holidays, extra assistance is sometimes needed to ship all the goods to our Program Partners. The Southwest Reservation Aid™ (SWRA) Program’s Thanksgiving service is certainly one project that needs a little help during the holidays. 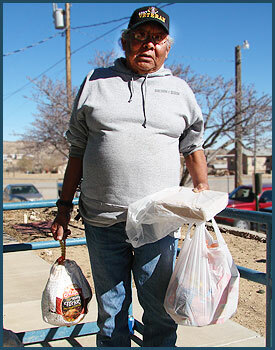 In 2014, over 1,400 turkeys and accompanying food items were delivered to 18 communities on three reservations of Hopi, Navajo, and San Carlos. 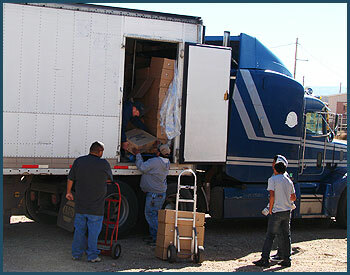 The truck deliveries covered two states: Arizona and New Mexico. Our staff traveled to several of the stops to meet up with the trucks and help with the distribution of the Thanksgiving meals. Home to about 1,450 residents, Tohatchi — or Tó'háách'ih, meaning “One Who Digs for Water” — was one of the 18 communities to receive the Thanksgiving meals. We arrived before the delivery truck, so we assisted in preparing the tables for the delivery. There were several Elders already waiting for their box with a turkey and fixings to take home. The Tohatchi center’s staff kept the waiting Elders busy with games, puzzles, and socializing. Once the truck arrived, the center had six volunteers to help set up for the distribution. Two volunteers, Tim and Mary Lou, set up tables and quickly formed a line to pack the Elder meals. Two others helped with the distribution of the meals by packaging and carrying the items to the Elder’s vehicles. Our staff was able to talk with a few of the Elders that picked up their Thanksgiving meal box, which was when we had the opportunity to visit with Pat. Pat’s favorite Native food, hands down, was his mother’s fry bread! Pat was very appreciative of the Thanksgiving meal he received. He planned to share with his family when they came to visit him for Thanksgiving. We were grateful for the good fortune to learn more about Pat and to help brighten his holiday, as well as so many other Elders.